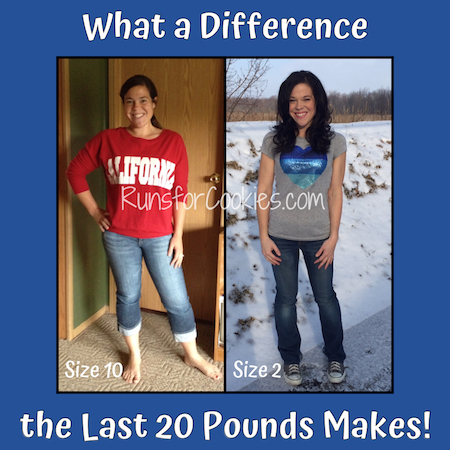 Runs for Cookies: What a difference the last 20 pounds makes! As you all know, I gained quite a bit of weight in 2014; and in spring 2015, I became the heaviest I'd been in over four years. I recently wrote about why that happened, and in August 2015, I started calorie counting. Over 15 weeks, I lost 27 pounds and got back to my goal weight. I was thrilled, because I never thought I'd see 133 on my scale again! Even though I wasn't trying to continue losing, my weight has continued to decrease, and I am now the thinnest I've ever been! In 2010, when I'd lost about 100 pounds, I wrote a post about all of the non-scale victories I noticed since losing the weight. That remains one of my most popular posts, and people always tell me how much they can relate to the "before" side of me. One hundred pounds is a LOT of weight to lose, and of course the changes were very noticeable from the 253-pound version of me. I got comfortable over these last few years of maintaining 100+ pounds lost, and had started to take a lot of those things for granted. When I gained nearly 30 pounds in 2014, I started to notice some of those things, because they were starting to reverse. Yes, losing 100+ pounds made a world of difference in how I felt; but surprisingly, going from 160 to 123 has made quite the difference as well. While weighing 160 wasn't nearly as uncomfortable as weighing 253, I definitely didn't feel my best. 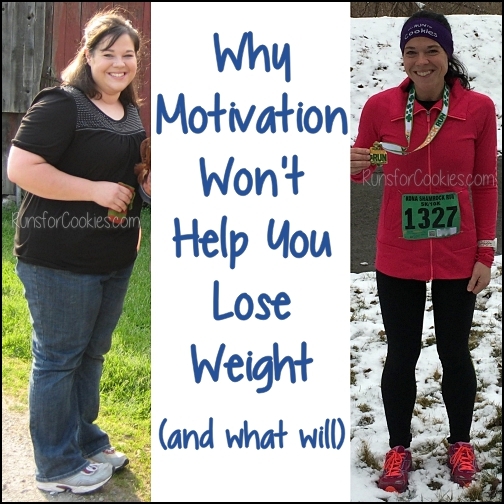 I'd like to write some of the changes here, so that people who don't have a lot to lose can see that those last pounds really do make a big difference. And, in my opinion, it's worth putting in the effort to do it! 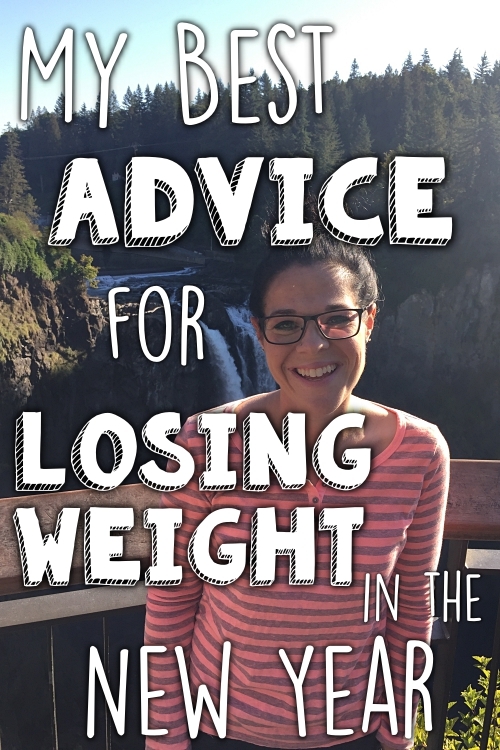 When I was at 160 pounds, I tried to convince myself that losing the extra weight was just cosmetic--according to my medical numbers, I was very healthy! I even wrote a blog post when I discovered I was a size 10, and I convinced myself to embrace the new size. But having lost that extra weight now, I realize that it wasn't just cosmetic. There are a lot of things that improved, and have made life a little easier. *My running pace improved significantly, even without training. At 160, I was injured, and I stopped running altogether for 6 weeks in August to heal the injury. 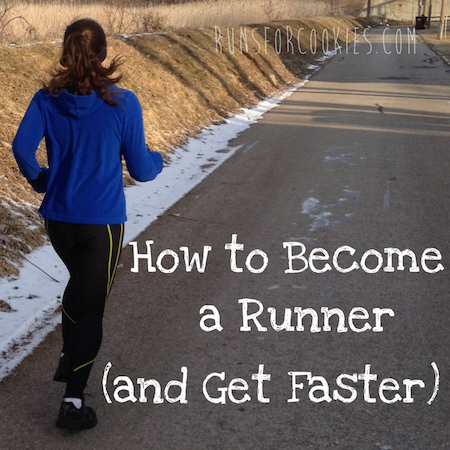 The next time I ran, I was 14 pounds lighter, and my pace was actually faster than it was before I stopped running. In August of 2015, my pace was 11:00+ minutes per mile; in October 2015, after taking 6 weeks off, my pace was under 10:00 per mile. That was solely due to the weight loss, because I hadn't run at all during those 6 weeks. And just recently, I actually PR'ed my 5K, running a 7:57 pace! *My clothes started to feel much more comfortable almost immediately. At 160 pounds, I was wearing size 10 (or 8 on a good day). Within a couple of months, I was back in my looser pairs of size 4's, and then when I got to 133, I was able to wear ALL of my jeans again. These last 10 pounds (going from 133 to 123), I've actually dropped another size, and I had to go buy several pairs of size 2 jeans! *I became much more satisfied with smaller portions of food and drinks. When I was binge eating during 2014 and 2015, and consequently heavier, I never felt satisfied. I felt like I could eat endless amounts of food. But losing these last 30-something pounds has made me get used to smaller portions. I never thought I'd see the day where I only wanted two slices of pizza, but here it is. A third slice would make me feel overly full. *I have a lot more energy now. I didn't realize it when I was gaining weight, but I started to feel more lethargic and get lazier. I wanted to sit more and move less. Getting back down to a healthy weight has given me motivation to move more. I start to get antsy if I sit too long. *I have chronic back pain due to arthritis and a couple of bone spurs on my vertebrae, and the weight gain exasperated it greatly. I remember going to the county fair with my family in early August, and we had to leave earlier than we would have liked because my back hurt so badly. 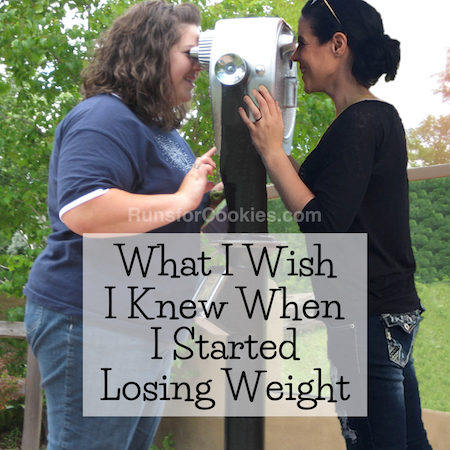 Losing the weight didn't eliminate the pain entirely, but it has gotten much more bearable. Some days, I don't even notice it, which is saying a lot! I can actually comfortably sleep on my stomach again; before, my back hurt too much to do that. *My confidence has soared since losing the extra weight I'd picked up. When I had gained a noticeable amount of weight, I always dreaded running into people I knew, and I hated having my picture taken. People talk about these kinds of things, and considering my weight loss had been so public, I knew people would speculate about what had happened to make me "fall of the wagon". Getting back down to goal weight (and below) has made me feel so much better about myself. I don't dread seeing people or having pictures taken. *I don't feel like a "phony" anymore, particularly with the From Fat to Finish Line documentary being released very soon. In the film, I was at my goal weight; and since then, I was dreading the release of the film because I was 27 pounds OVER my goal. I felt, for lack of a better word, like a phony. Now, having lost the extra weight and actually being under my goal weight, I feel proud for the film's release. I'm obviously not trying to hide the fact that I had gained weight, but if people check up on me to see if I've kept the weight off, I am glad to show that I am under my goal. *When I was noticeably over my goal weight, and received some hurtful comments on my blog about it, I became very self-conscious. I constantly felt so much pressure to lose the weight, but I was having such a hard time actually doing it. The stress and anxiety was a big binge trigger for me, and I felt better when I was eating (only to beat myself up for it later). For a year or so, I spent SO MUCH TIME thinking about my weight and feeling like I'd let everyone down. I feel like I missed out on a whole year of my life because of stressing over my weight! I wish I hadn't had that reaction, but the fact is, I did. I can't even describe how much better I feel now that I don't have that hanging over my head. I wrote a post called "Get it over with", which explains all of this in detail, and now I have gotten it over with. This new headspace was completely worth dropping the extra weight I'd picked up. This is a great post! 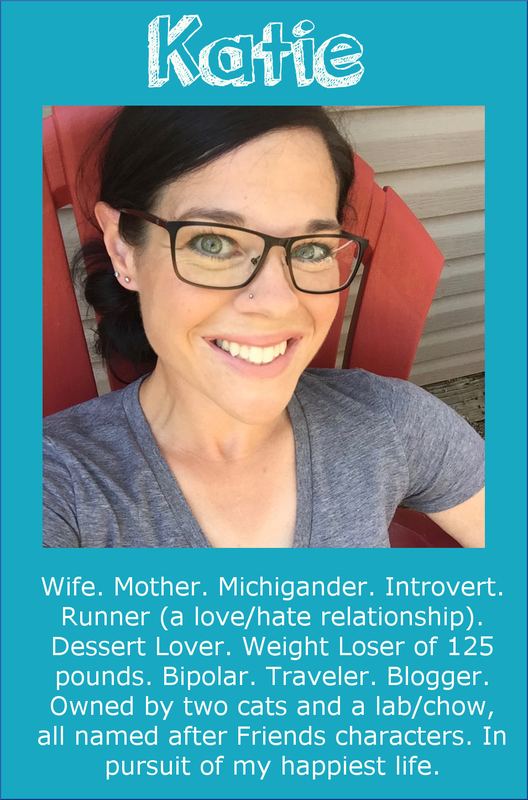 I can totally relate to your "before" self, but I keep reading your blog because I love the fact that you're still you, not like some people who lose massive amounts of weight. I found the part about being good with smaller portions really interesting, it makes sense, but for some reason I thought it would still be such a challenge, good to know it becomes easier. I can also totally relate to feeling like a phoney and dreading seeing people you know, can't wait for the day when this is no longer an issue. Oh, and yay for muscle definition!! GO YOU! Believe me, sometimes it still is challenging--mentally, I may want more, but I have to remind myself that I will feel physically ill if I continue to eat. It's really interesting to me how I am satisfied with a much smaller portion, though! When I was 253 pounds, I would eat half of a large deep dish pizza, AND half an order of mozzarella bread. At 160, I would eat 3-4 pieces of regular pizza. And now, I eat 1-2 pieces of of regular pizza. And I feel just as satisfied! I love reading your blog, and appreciate your openness and positivity. I also think it's important to remember that many people are healthier at a much higher weight or BMI than you are currently, and trying to get to a low number that isn't right for you can be detrimental to your mental and physical health, and lead to more weight cycling. Many people struggle with restrictive eating as binge eating's ugly stepsister. Balance is as important as learning not to binge, and problems like being afraid to take photographs are created by our perspective on our weight, not the weight itself. 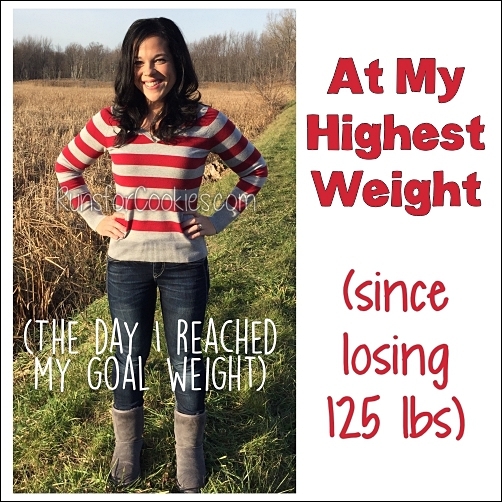 Hi Katie - thanks for posting this, so much more motivation to lose those last 20 pounds that are standing in my way! One thing about this post really struck me and I wanted to compliment you on it...having been a reader of your blog for over a year now, I think this is the first time I've heard you mention your chronic back pain. I am really impressed that you have not let such a painful, debilitating thing stand in your way of achieving your goals. And the fact that you don't use it as an excuse, and you never complain about it on the blog (let alone mention it!) is really impressive. I hope you find ways to continue to battle the pain that still let you be the active person you are. Thanks for all the inspiration! Thanks for reading! I've written about the back pain a few times, particularly last August, I believe. It had been getting so much worse, so I ended up having an MRI to find out what the problem was. (I was diagnosed with arthritis in 2007). The MRI showed two large bone spurs, which I was actually really happy to hear--I was starting to think I was crazy! I was in SO much pain sometimes, but I kept chalking it up to arthritis. I'll always have pain, unless I have the spurs removed surgically, but I'm not to that point yet. Yay Katie! I'm really proud of your accomplishments. Thanks for being honest and open (even when it is difficult); I admire that sooooo much! I'm on the downward trend, weight-wise, and it isn't as smooth a path as I would prefer. However, it is my path and I'm spending a lot of time and effort getting to the root of my food schtick. Your blog has played an important role in helping me get as far as I have (including a PR on my last half!). 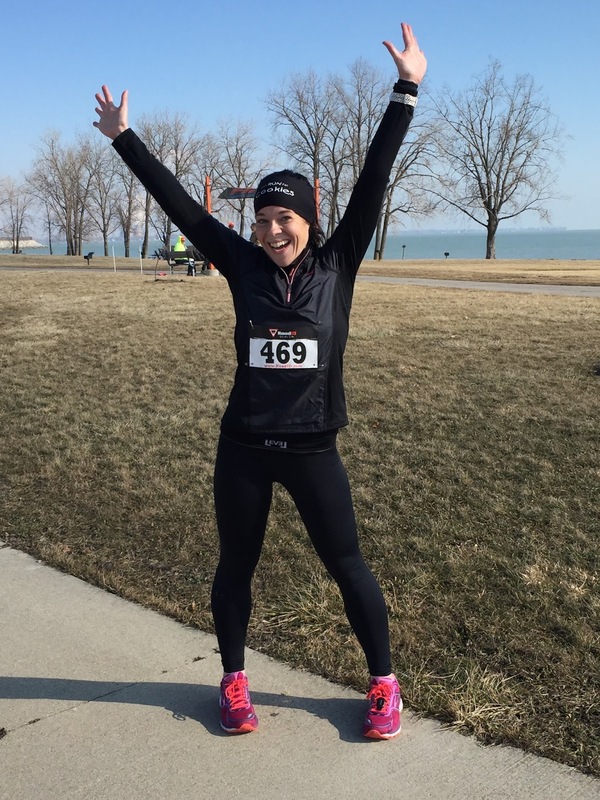 Martine, that is AWESOME that you PR'ed your last half! Congrats to you! Fabulous post, and very inspirational as usual! I have regained about 10lbs since my lowest weight (I wasn't quite at my goal weight) and definitely feel the impact on my self-confidence, despite feeling healthy. I'm heading out for a run today and you've bolstered my resolve to stick to my guns and shed these last 20lbs :) Thank you! I have a lot more weight than 20 lbs to lose, but I am glad to see there is still light at the end of the tunnel. I got down to within 20 lbs of my goal weight a few years ago and then it was like I stopped caring. I gained back a lot of weight and am really struggling with the emotional stuff at the moment. I love reading your blog and especially love your recent series on binge eating. It has made a huge difference to me. 10 days binge free! Thanks for the extra motivation today! You rock! This has been the post that speaks to me most. Totally motivating me to keep going for those last 8-10 pounds....sometimes I think "Oh, close enough or good enough or will it make that much difference"....but you kind of assured me that YES IT DOES. I've seen your Wednesday posts, but for whatever reason am just asking this now - what do you use to monitor your body fat? Have you considered adding in some strength training to help with your arthritis and/or back pain? I'm sure there are some exercises out there that would help! It's been an incredible journey watching you really sink into health these past few months, Katie! I'm really glad to see where you are right now, and I hope this continues! Such a great honest post! Thank you for it!! Thanks to your blog only I tried running on the treadmill at the gym the other day. I am a total non- runner))) will try again for sure! Got to lose the 15 that are bothering me so so much! Thank you Katie! Thank you so much for this post. I am currently at a healthy weight based on my BMI, doctor's recommendations, and personal trainer's recommendations. But I know, being honest with myself, I am still carrying around too much weight. This is a great write up of all the things I can look forward to when I find my ideal weight in 20 or 30 pounds. Keep up the great work! We learn when you share your struggles with me, and you give us great ideas and motivation when you share your success!